Social media isn't going away. What's important for business is to understand how it affects the lives of our customers. For that reason, I've structured the presentation so as to explore 6 social networking trends first from the perspective of the consumer and then in terms of what these trends mean for business. As I noticed firsthand when documenting Social Media Networks Roundup: Which Ones Matter to You?, how people use social media has changed since the tools were first introduced. Those changes are opportunities for thoughtful businesses. Wondering what’s hot and what’s not in social media? Still on the fence about social networking for your business? Confused about how Pinterest, Houzz or Instagram can help you generate business? Not sure why you should ask customers for Yelp and Google+ Local reviews? Attend this session to get the lowdown on what’s happening socially online and what you need to do to keep your business on the forefront of customers’ minds in 2016. What Are The Top Social Trends of 2016? I'll examine these six trends first from a consumer perspective and then look at how businesses can deal with these trends. This session will be interactive. I'm interested to hear what social trends session participants have noticed developing in their markets and how they're reacting. Depending on whether you're in a rural vs. an urban setting, or dealing with local customers vs. ones from around the country, you may notice these trends progressing at a different speed. As you might imagine, this is a rich topic and I've come across many interesting articles exploring social networking trends. I've listed them below starting with my favorite resource, Mary Meeker's 2015 State of the Internet Presentation. So Which Ad-Blocking Parasite Are You Going To Go After, The Consumer or The Tech Company? Imagine There's No Marketing.. "It's Easy If You Try"
Adding fuel to the fire: How important is Facebook? How Will Your Business Be Affected By These Digital Social Trends? Yes, these are interesting times with plenty of change and lots of shiny new social tools. These are also times filled with many interesting opportunities for businesses wanting to connect with their customers. Are you ready to explore? 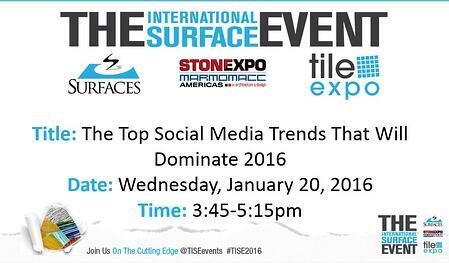 I hope you'll join me for this session during TISE 2016 which takes place on January 20th, 2016. To attend, be sure to include IGNITE Education with your registration!